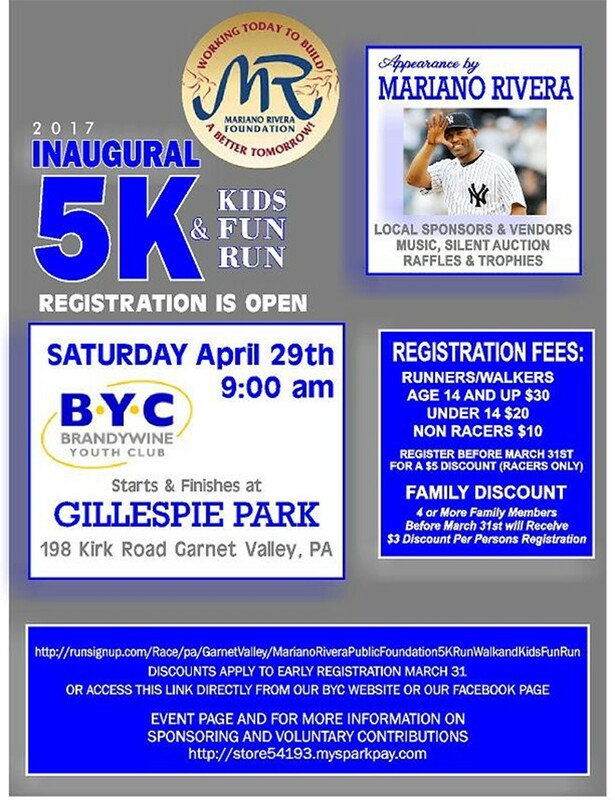 The Mariano Rivera Public Foundation and the Brandywine Youth Club (BYC) are proud to announce the Mariano Rivera Public Foundation Inaugural 5K & Kids Fun Run to be hosted by the BYC at its Gillespie Park baseball complex in Garnet Valley, Pennsylvania on April 29, 2017. This exciting and fun-filled day will include a timed 5K race and a Kid’s Fun Run. Mariano Rivera, the All-Time Major League Baseball leader in Saves, 5-time World Series champion, and certain first ballot Hall of Famer, will be coming to Garnet Valley to attend the event! The Mariano Rivera Public Foundation is a community-oriented foundation whose mission is to assist young people from impoverished families. It emphasizes youth activities, serves local communities in need through community service, educational programs and scholarships and seeks to help youth and families to advance for the betterment of future generations. The Brandywine Youth Club has served the youth of our community since 1955 through sports programs geared toward helping children in the development of positive life skills and self concepts through the provision of safe, enjoyable recreational opportunities and the emphasis on the importance of sportsmanship, teamwork, honor and integrity. The Foundation and the BYC are teaming up through this exciting event to help support both organizations. Proceeds will support the Foundation’s goal of providing new backpacks and needed school supplies to impoverished children in Wilmington, Delaware for their first day of school this September. Too often children from impoverished families attend school without the very basic supplies they need to succeed and regrettably the schools that these students attend typically cannot supply these items for them. A portion of the proceeds will also benefit the Brandywine Youth Club in support of its continuing mission to fund its athletic programs, while keeping costs to a minimum for families.